Order the Paperback, get the Kindle edition for FREE! 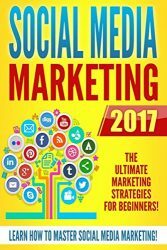 This book will help you get acquainted with social media marketing for business. By discussing what social media is, how it can be used other than for personal networking, and what different platforms are available for you to utilize, you will gain valuable knowledge on how to take advantage of this innovation to promote your brand and boost your business over time. Social Media in a Nutshell The Basic Rules of Social Media Marketing Social Media Marketing Approaches Engagement Social Bookmarking Websites Much, much more!